When the couch becomes too comfortable, a coach can motivate and instruct you to transform. 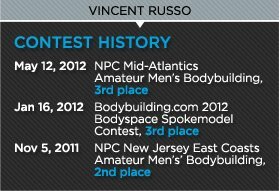 Follow Vincent Russo's full program and get back in the game! Football combines the best and worst of our nation, the impactful violence balanced by emotion, ability and teamwork. The skills and lessons gained from the gridiron help define many a man. Super Powers: I can eat more eggs (omelets), nachos, popcorn, and hard shell tacos than anyone I know. Ultimate Goal: To live the healthy and fit lifestyle and inspire as many people as I can along the way to do so as well. Vincent Russo, a 25-years-old physique competitor, lives a sports life. He played linebacker in high school and college, and now that he's done playing, he relays his knowledge to the next generation of gridiron athletes. In his football days, Vinny wasn't so concerned with health and nutrition. He tutored in the gym under his father learning basic lifts, but mainly he was trying to pack on muscle to smash tailbacks into the dust. "I wanted to be a meat fridge," Vinny says. "I didn't know a lot about nutrition, so I was a meat fridge with power and speed, but not that much definition. "I've been doing it so long, it's just a part of me. If I were to not train, I'd feel like I was cheating myself. It's a competitive nature. It drives me." Premium bodies require premium supplements, but don't forget to use your brains! Follow Russo's supplement stack and win the fitness game. Vincent Russo practices what he coaches. Follow his training program to your own game-winning physique! 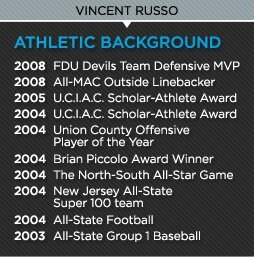 Like many athletes, Russo had powerful influences who helped guide him through his athletic ventures. Now that he is done competing in football, he gives back to the sport through coaching. And he found a perfect place to guide his athletic flow toward: the newly created Men's Physique Division in competitive bodybuilding. The two physique paths present divergent ideologies. Bodybuilding is a selfish training system, where self-improvement takes precedence. Coaching is a self-less act, where teamwork rules as the self dissolves into group dynamics. "There's an indescribable feeling I get knowing that not only am I changing their body composition through proper nutrition and exercise, but I am changing their mindset," Russo says. "Maybe they can take that mindset with them and pass it to their family, who maybe don't eat as healthy and take certain risks. A domino effect can come out of this, where everyone starts living a healthy, fit lifestyle." Russo was a finalist for our 2012 BodySpace Spokesmodel Search, and we are proud to now call him one of our own! Chalk Talk From Coach Russo! "I started weight training for sports with my father in high school. We started with basic power lifts and multiple training techniques for speed. As I saw results, I fell in love with the feeling. I took this attitude with me while I played football in college and basically became a "meat fridge. "I had a lot of size and strength without much definition. I didn't know enough about nutrition, so I started reading everything and anything I could find that involved nutrition. I joined Bodybuilding.com and its BodySpace community and this is what first started my progression. "The support I got from the community as a whole, as well as all the nutritional and exercise information provided is more than I could have asked for. "I get many of the supplements I use from the site, which aided my transformations. Slowly but surely I changed the way I ate, the food I bought, and the times of day I ate. It went from reading forums, magazines and books, to asking professionals to get an understanding of what to eat, why to eat it, and when to consume my fuel. "The change in my diet sparked my results, and I stayed with it. Making progress on my own got me thinking about competing, but I only had limited knowledge. I went out and found G-Force. G-force is a company used to help competitors become competition-ready, or to help anyone try to live a healthier lifestyle. "I never did a competition before and wasn't sure how to go about it, but G-Force provided me with well-renowned trainer Danny Hawtin. He showed me the ropes and is the reason I am where I am today. I wanted to do bodybuilding, but he insisted I take up Men's Physique so I took his advice and we went from there. He adjusted my diet, workout, and cardio plans and met with me regularly to keep making adjustments. My body-fat levels decreased dramatically. My metabolism increased 10-fold, and I never felt better." Pep Talk! / Quitter's Inferno! These four examples deal with Negative Nancy B.S. Your job is to rescue these weak hearts from the pits of despair! I just got out of high school (thank G!) but without my coaches screaming at me, it's hard to get back in the gym. A little help? LOL! I know exactly what you mean! Having that person there to push you above and beyond your limits always helps, but you have to think of it as if you are the one pushing yourself to the front of the line. You took it upon yourself to sprint harder and faster than the rest of the team. You had someone there to yell and make you feel as if they were "forcing" you to run harder, but you need to see it as they provided the path and now you choose to run it! YOU sprinted harder, YOU lifted more when they demanded it, therefore YOU already have it inside of you. You need to reach down and unleash the beast that lay inside of you, because you already proved you have it in you. Find that little extra motivation to unleash it. To gain that little extra motivation, start off with a training partner. I find when I train with someone I need to push more weight or more reps than that person and we motivate each other to do so. This helps unleash my beast even on days when I drag! I've been trying to grow my biceps for 10 years and it just won't work. I've tried everything! Should I just accept my puny pipes? A lot of this has to do with genetics and if you are unable to develop big biceps then so be it and accept it. But before you accept it, you can try multiple training techniques that may spark growth. Train arms on their own separate day so you concentrate fully on them, add dropsets, lift past failure with the help of a spotter, and use the rest-pause technique. Realize, your triceps are actually 2/3 of your arm size. If you want big pipes, you need to work triceps to fill sleeves. Add heavy compound movements and stimulate the muscles! I just got out of prison and my family abandoned me. I got ripped behind bars, but can't afford a gym now. You got room at your place? I don't know you or what you did to go to prison, and I wouldn't judge you either way. Point is, I don't own a gym. I join a gym and reap the benefits of having a membership there. You need to work on getting a job to develop some sort of income before you worry about how you look. Get your priorities in order, and when you do have some flow, worry about a roof over your head, food on the table, and then how much a gym membership will be. Hey Vinny! I was a stud athlete back in the day, but with two new knees and a slipping back I think my lifting days are done. Forget it. I quit. Those injuries would set anyone back. You need to find alternatives to keep stress off your back and knees. The elliptical is a great cardio alternative if your knees bother you. For weightlifting, stimulate the muscles through pausing at peak contraction points to stimulate growth instead of pushing ample amounts of weight. As much as you want to be that stud athlete again, it's hard with your injuries and you need to accept that. But do not accept quitting as an option! Stay away from heavy squats, leg press, and deadlifts and stick to more controlled isolation exercises for particular body parts. Quitting never is an option. If you love to be in the weight room and love living a fit lifestyle, you find it in yourself to find alternatives to help you stay in the game. Consult physicians for exercises that may help alleviate pain. I just can't do this exercise crap. I'll never look good enough. There is only one way to find out if that is the truth. You have to try; push yourself beyond your limits. If you go through the motions, then yeah, you waste your time. If you need help working out, you can always look into a personal trainer. They guide you, push you past comfort zones. It will be tough on your body, and you will want to quit, but to see changes you need to look at yourself in the mirror, dig deep down inside, and push through pain! The only way to succeed in the weight room is by failing! Push yourself to the point of failure, and strive for one more rep! Weight training is 1/3 of what needs to be done; proper nutrition, supplementation and cardio make up the rest. When these three are fine-tuned and you work them together, you see drastic changes in time. IT WILL TAKE TIME, so give it a chance, set realistic goals, and FINISH! This doesn't happen overnight, if it did, everyone would be fit! I personally set a 1-year goal for myself, and at first, it was hard. I cheated and veered away from my goals, but I kept getting back on track. As time went on and I gained knowledge on nutrition and supplementation, everything became easier. I no longer needed certain foods, and I set daily plans: what to eat, when to eat and what/when to workout. Set goals, have a plan, and complete it!